Have you seen Coral Greenbrier? 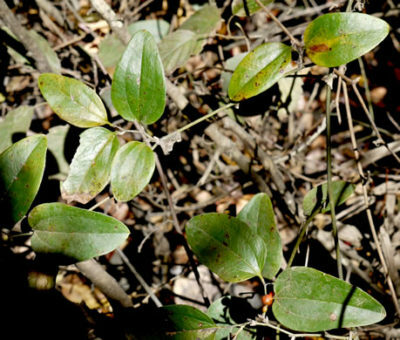 In a joint effort to expand the knowledge and understanding of the flora and fauna of Polk County, Conserving Carolina and botanist David Campbell need your help in locating this month’s “Polk County’s Most Wanted—Plant,” Coral Greenbrier (Smilax walteri), a woody vine in the genus Smilax. Anyone who spends time outdoors in our region is (painfully) aware of Greenbrier vines, sometimes referred to as Catbriers or Blaspheme Vines. These Brier species are perennial vines and belong to the genus Smilax. Several species occur in Polk County–some are evergreen and others are more or less deciduous. All species in our area have bluish-black fruits with the exception of one. Coral Greenbrier (Smilax walteri) has bright red fruits, giving rise to the common name. Where do you find Coral Greenbrier? Coral Greenbrier is confined to wet sites, such as bogs, swamp forests, or floodplains. In addition to its red fruits, Coral Greenbrier may be separated from other members of the genus by the color of its flowers, which tend to be light-brown, as opposed to the greenish coloration of the more common species in the region (Greenbrier and Round-leaved Greenbrier). Coral Greenbrier flowers in early spring, so this is not a characteristic to be searching for this time of year. The leaves of Coral Greenbrier differ from others in its genus in that their bases tend to be rounded, with leaves tapering to a point. To the casual observer, this may not be an obvious difference. Smilax walteri is distributed primarily along the Coastal Plain from southern New Jersey to eastern Texas. Although uncommon in the piedmont and low mountains, some sites are known to exist. This species has been documented as occurring in eastern Polk County, as well as Henderson County and Greenville County, SC. Late fall and winter are a good time to search for this vine, as its distinctive red berries really ‘stand out’ and are obvious from a distance. 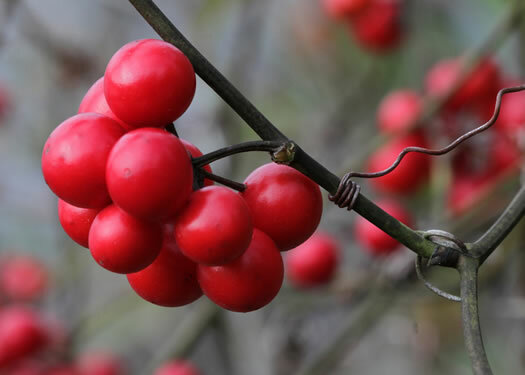 Look for it in low wet woods and swampy sites, often clambering over small trees and shrubs…and don’t forget to look up for those beautiful scarlet berries. If you think you’ve seen Coral Greenbrier in Polk County, please send photos, questions, or comments to Pam Torlina. By phone at 828-697-5777, ext. 300 or email, pam@conservingcarolina.org, so we can document its occurrence in Polk County. See more information about “Polk County’s Most Wanted.” Download and print a “Pocket Guide” with all of the “Most Wanted” plants, animals, and habitats that you can be on the lookout for when you’re out in the field! “Coral Greenbrier (Smilax walteri) leaves” was taken by JK Marlow and is used with permission; “Coral Greenbrier (Smilax walteri) berries” was taken by Will Stewart and is used with permission.